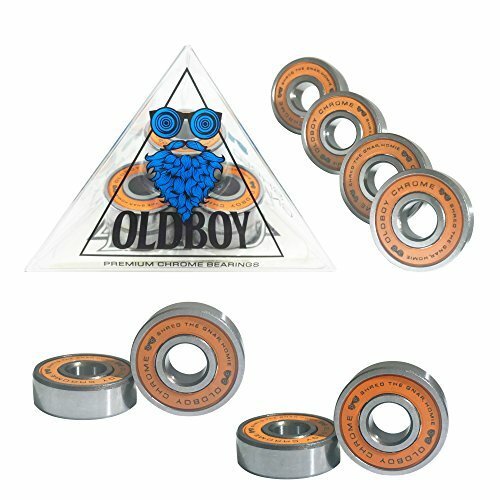 Oldboy Chrome bearings are great value to meet you skating needs. Our design team made this set of chrome metal bearings to give you the best possible skating experience at a low price. These 608RS bearings with an inner and outer chrome ring, nylon casing and 7 highly polished tempered steel balls will permit your wheels to spin smooth. Low cost means you can thrash and replace them often. One shield for easy clearing. NO RISK: we will replace or refund any order that doesn't completely please you. Just contact our support for help. The mission at Oldboy Longboards is prolong the awesomeness of skating for as long a possible. No matter your age, young, old, dead, give us a try. Oldboy Longboards is a private label outdoor sports company located in Kirkland Washington, USA. Our region near Seattle is known as a center of technical and cultural innovation. We tap that spirit of cutting edge creativity to carve a path to longboarding excellence. We provide premium bearings and boarding accessories on Amazon.com and at our web page in the US and throughout Europe. Oldboy was founded by a team of Amazon sellers and college students who have a passion for boarding. These Chrome Bearings come packed in a patented pyramid box for "good vibrations". Add a set of Oldboy's to your cart above and shred the gnar, homie! HEAVY METAL: Set of 8 Chrome Steel Bearings for skateboards and longboards. Great value to meet your skating needs. TEMPERED STEEL: Each bearing is made with 7 super hard steel balls inside a nylon cage for durability. These Oldboys are designed get your board moving..
RIDE LONG AND SMOOTH: Replace your worn-out bearings with a new set of Oldboy 608RS Chromes to maximize your skating enjoyment. Lower costs means you can order two sets to replace worn bearings the next time quickly. OLDBOY SWAG: sticker included in every set. NO RISK: we will replace or refund any order that doesn't please you. Just contact our support. PYRAMID POWER: Distintive pyramid box (patent pending) for totally tubular skating experience. Add a set of Oldboy Chromes to your cart above. If you have any questions about this product by Oldboy Bearings, contact us by completing and submitting the form below. If you are looking for a specif part number, please include it with your message.